TS School Complex meetings Schedule, TS School Complex Level trainings time table, Agenda Items, Discussing items, TS School Complex meetings, Training module for School complex Head masters : DSE Telangana and RMSA has given detailed guidelines for conducting of School Complex Level Training for primary teachers and upper primary teachers for this academic year in effective manner. So, School Complex level trainings should be conducted at cluster level for primary school and upper primary school teachers on expected themes and organizing complex meetings at cluster level is one of strategy to enhance the capacity building of the teachers provide continuous support to the teachers for improvement of quality education. In this connection a Training module prepared for School complex Head masters for conduct of SC Meetings. 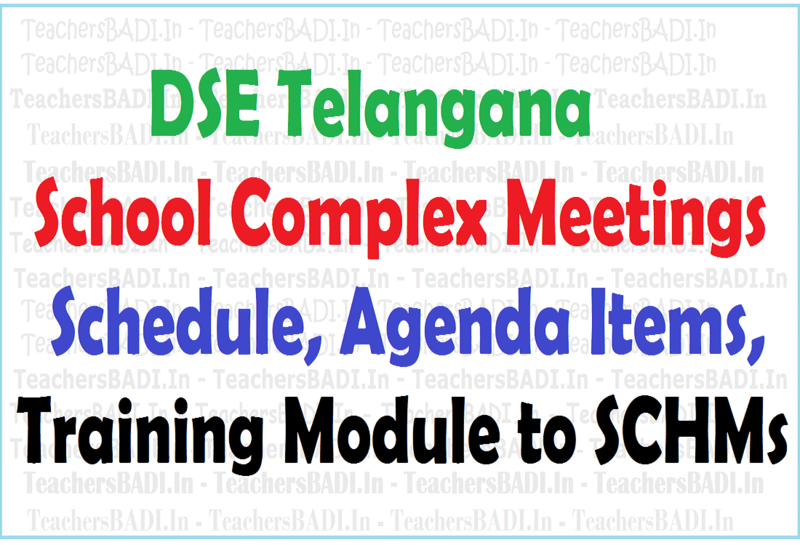 In this module, TS School Complex Level Trainings Schedule/ Time table, Agenda Items(Discussing items, Duties of SC HM, Schools Monitoring and more details have been placed. SCERT Telangana - Rc.No. 862, Dated: 02.11.2017 :: Sub: SCERT, Telangana, Hyderabad - Conduct of School Complex Meeting in the first week of November, 2017 - Review of attainment of Learning Outcomes- Reg. All the District Educational Officers and Principals of DIETs/ CTEs/ IASE in the State are hereby informed that the first Summative Assessment has been conducted in all the schools in the State from 23.10.2017 to 28.10.2017 as per the schedule of the Academic Calendar for the year 2017-18 and guidelines communicated by the SCERT vide reference 151 cited. In the same guidelines, instructions were given to DEOs to give the orders to all the schools to undertake the following post Summative Assessment activities in their respective schools. • Analyze the answer scripts: To analyze the answer scripts of the students, examine how the students have responded to the questions given in the summative test. • Identify the learning deficiencies: Identify the learning deficiencies in terms of attainment of learning outcomes communicated by SCERT. • Remedial teaching/corrective measures: Serious effort shall be made to undertake remedial teaching/corrective measures to ensure the attainment of learning outcomes by the individual. The learning strategies such as individualized teaching, tutoring, differential teaching, teach - re plan-re teach could be adopted. • Learning outcomes: Effort shall be made on continuum basis to ensure the attainment of learning outcomes by the students prescribed for each level for every subject by the SCERT. In the wake of National Achievement Survey being conducted for classes Ill, V and VIII on 13th November, 2017 across the Nation in identified sampled schools, the attainment of the Learning Outcomes by the students before the conduct of NAS assumed greater importance. To show better performance by the Telangana State in the NAS, there is a need to double up the efforts of the teachers to improve the performance of the children in a stipulated time period. National Achievement Survey-2017 is a survey of Learning Outcomes. In this background, the conduct of School Complex Meetings will be helpful to gear up the resources and to re-energize the spirit of the teachers to show better performance of the students in the NAS for classes Ill, V & VIII and also the academic improvement in general in all other c;:lasses. Therefore, the DEOs are requested to conduct a School Complex Meeting in the first week of November, 2017 for Elementary Level and for High School Level. In case of School Complex Meetings at Primary Level, they can be conducted as per the existing practice. Whereas for Upper Primary and High School Teachers, subject based School Complex Meetings shall be conducted. Further the teachers shall be instructed to attend the school complex meeting with the following pre-requisites. The teachers shall be instructed to complete the following activities before attending the School Complex Meeting. • Completion of analysis of the performance of the students in the first summative test in the light of learning outcomes communicated by the SCERT in respective subjects. • Identification of areas/ concepts/ skills where the student needs further help in the curricular subjects. First session (09.30 AM to 10.30 AM): Discussion on understanding the importance of the learning outcomes, aligning the teaching learning process, assessment process with the learning outcomes. Second session (10.30 AM to 11.15 AM): Based on the analysis of students performance in the summative test, identification of learning deficiencies of the students vis-a-vis with the learning outcomes prepared by SCERT. • Evolving the strategies or action plan to enable the students who are lagging to achieve the expected Learning Outcomes. Fifth session (03.45 PM to 05.00 PM): Preparation of supporting learning materials and evaluation items with a focus on attainment of learning outcomes. • 'Ihe services of DRPs/ SRGs who have conducted the training at District/ Sub District Level in the Learning Outcomes shall be utilized as a Resource person for the school complex meetings. • The school complex meetings shall function in the form of workshop mode, discussion centered, shall give scope for more hands on experience through group work/pair work/individual work. • The School Complex Meetings shall be monitored by the Nodal Officer, and the concerned Sectoral Officers of SSA and RMSA at District Level, Principal & faculty of DIET /CTE/IASEs. Therefore, all the DEOs are in the State are requested to take immediate measures for effective conduct of School Complex Meetings within the first week of this month, where the School Complex Meetings shall act as a catalyst to improve the academic performance of the students with special emphasis on attainment of the Learning Outcomes. '6' School complex meetings for 2017-2018: The Department of School Education has conducted Teacher Trainings at Primary level, UP level and at Secondary level in first and second week of June, 2017 in non-language subjects in all the districts in the State. There is a need to consolidate the learning of the teachers in the post-training period on the various academic issues discussed in the training viz. Here the School complex meetings play a critical role in revitalizing the energies of the teaching community towards shared goal i.e “Improving the classroom processes for better learning” More over the School complex meetings are not mere meeting of teachers, in fact they are the centers for conduct of training of teachers on continuum basis. In Fact the school complex meetings are the extension of the training of teachers. The AWP & B of SSA indicates the School complex meetings under training component. Although the present framework of school complex meetings covers only Elementary schools ie teachers handling classes I to VIII. As a matter of fact Class-VIII and upper primary sections VI & Vii classes are part of High schools as per the structure of High schools in the State. The teachers who are handling these classes, at least class-VIII are handling classes IX and X. Hence in this background, the concept of school complex meetings may be extended to even for the classes IX and X which falls under RMSA. Although the teachers are one and same teaching VIII, IX and X , with the extension of classes, the teachers may have the opportunity to discuss the academic issues of classes IX and X also. 2. For the first complex meeting at primary level, the subjects may be dealt is Maths & EVS. Based on the training received in May/ June, 17, the respective teachers shall attend the school complex meetings either on Maths or EVS. 3. In case of Upper primary level/Secondary level, respective subject based School complex meetings could be conducted. In case of Maths, Physics, Biology, and Social studies, they shall follow the agenda given below, as the school complex meetings are the extension of the training for re-enforcement. The school complex meeting for languages may also follow the same schedule with adaption wherever necessary. 1. Display of Teaching plans: lesson plans/unit plans already prepared by the participants in their respective schools. 3. Discussion and reflections on the best features of the lesson plans on intended learning outcomes (Academic standards), content mapping, Teaching Learning process, learning experiences, use of TLM, Motivation, Activities, assessment processes, innovations and other relevant things. 4. Preparation of a unit plan/lessons plan in groups based on the observations and discussions generated in the session on the topics of forthcoming syllabi. 1. Lesson demonstration by each group and followed by discussions – on feasibility, practicality in the classroom; Any innovative classroom practices, content organization, lesson presentation: assessing pre-requisite abilities, abridging of new concepts, sequence of learning activities, use of appropriate learner centered pedagogical interventions, involvement of learners in learning process, organizational aspects of lesson presentation, learner assessment. 1. List out the Identified learning difficulties of the students in the topics that were taught during June & July. 2. Categorization of topics under broader areas. 3. Discussions to find out the root cause of the difficulties and for exploring possible solutions. 4. Preparation of plan of action individually or if the problem is similar make a group and plan in group then implement in their respective classrooms. 5. Preparation of log book for implementation of above said plan indicating date, specific action initiated. (The log book should be brought to the next school complex meeting for review). 1. Identification of Academic standards (learning outcomes) for the topics to be covered under first formative assessment. 2. Discussions on the various assessment tools to be employed for formative assessment in accordance with the academic standards identified. 3. Planning process: Evolving broader framework for first formative assessment – what content? Which Academic standards? What Assessment tools? 6. Preparation of test items. 9. Analysis of Pupil performance, identification of learning difficulties, remedial measures initiated to overcome the learning difficulties and success of the intervention. 10. The experiences of followup action shall be shared in the next school complex meeting. 2. Therefore each School complex meeting may be tagged with one DRP. If sufficient DRPs are not available, the services of SRGs of concerned districts and the expert teachers who worked earlier as DRPs/MRPs may also be considered. 3. The school complex meetings shall function in the form of workshop mode, discussion centered, shall give scope for more hands on experience through group work/pair work/individual work. 4. The school complex meetings shall reflect the felt needs of the teachers and try to offer the solutions on the professional challenges they met in terms of pedagogical and content issues, but care should be taken that it should be in the gambit of the agenda of the meeting. Schedule of School complex Meetings for the year 2017-18 and Agenda of first School Complex Meeting to be conducted in the month of July, 2017. As a follow-up of the training of teachers, the SCERT has proposed to conduct the school complex meetings which helps to consolidate the learning of the teachers in the post-training period on the various academic issues discussed in the training viz. Discussion on implementation of co-curricular activities in the schools. Model lesson by identified teacher by the school complex HM/Asst.Secretary and observation and suggestions on model lesson. Sharing of observation reports and academic guidance by school complex HM/MEO on school visits. Listing and sharing of project works by the subject teachers. Preparation of agenda for next complex meeting by participants and complex HM. The agenda of school complex meeting of Sept,2017 must consist of the 3Rs programme, which is ow in practice in ll the schools. Thank u very much! B. Usharani, SGT, GPS, sadar bazar bolaram. TRMG, Hyd.